Seymur Hezi, a reporter working for Azadliq, Azerbaijan’s last independent newspaper, was sentenced to a two month pretrial detention on Monday, charged with disorderly conduct. This morning, journalist Khadija Ismayilova was detained at the Baku airport, according to the Institute for Reporters’ Freedom and Safety (IRFS). Hezi’s arrest is another sign of the continuing clampdown by Azerbaijan’s authoritarian government on civil society. The journalist was charged with an alleged attack on a person in the street, although his lawyers claim he was trying to protect himself after he had been harassed and attacked. It is not the first time charges of hooliganism and disorderly conduct have been applied against opposition politicians, civil society activists and journalists in Azerbaijan. In previous years, the same charges were used to imprison critical journalists Sardar Alibeili and Ganimat Zahid as well as bloggers Emin Milli and Adnan Hajizadeh. “Seymur Hezi’s arrest is a serious blow against our newspaper. 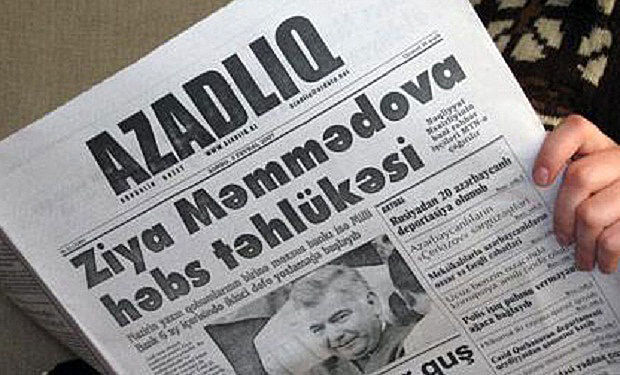 He is one of the brightest Azerbaijani analysts and journalists, and a true intellectual,” Rahim Haciyev, acting editor of Azadliq newspaper, told Index. The journalist’s arrest came only a month after the newspaper he works for, Azadliq, was forced into suspension of publication due to financial pressure from the authorities. Now it exists only in its online version. The authorities of Azerbaijan continue their clampdown on the civil society of the country. Well-know human rights defenders Rasul Jafarov, Intigam Aliyev, Leyla Yunus and her husband Arif Yunus are still behind bars after they were all sentenced to 3 months of pretrial detention. The office of the Institute for Reporters’ Freedom and Safety (IRFS) was searched and sealed. This wave of repression is connected to new legislation in place in Azerbaijan that restricts the freedom of association. In fact the new law makes it illegal for unregistered civil society organisations to receive funds for their activities.